I’ve been to Bologna once before for a very quick day trip with friends. This time I went for work. Bologna is consistently rated as one the most liveable cities on the planet. The cuisine is amazing, there are many companies based in the area in a variety of sectors, and a well educated population (the oldest university in the Western world was founded in Bologna). I knew this before I started researching my trip. I didn’t know, however, that there were so many fantastic stores for interiors. I was in décor heaven and I could not get over how friendly everyone was. My sister’s former colleague, John, is in Bologna writing his dissertation and we had lunch at Drogheria della Rosa. It was just as delicious as I remembered and it’s one of John’s favorite restaurants in Bologna. John was kind enough to bring me a bunch of shelter and cooking magazines from the States. Later I met up with the lovely Tina for an aperitivo before catching the Italo train back to Rome. It was a nice way to end a long but productive day. I hope I will be able to return to Bologna soon. Housed in a former furrier’s workshop, this store blends design, art, and fashion. Borgo delle Tovaglie began as a tablecloth manufacturer in the early ’90s. In 2005 Valentina Muggia and her husband Giuliano Di Paolo bought the company. Today the brand is internationally known for it’s quality and style. This is their first store and it’s a beauty. They carry a variety of brands in addition to their own. There was so much to see (and buy). I loved their plates in a bucket. Very clever and useful. This store is located in the very pretty Piazza Santo Stefano. Owned by Matteo and Rebecca, here you find one of kind objects from Italy, France, Spain, Sweden, and other countries. 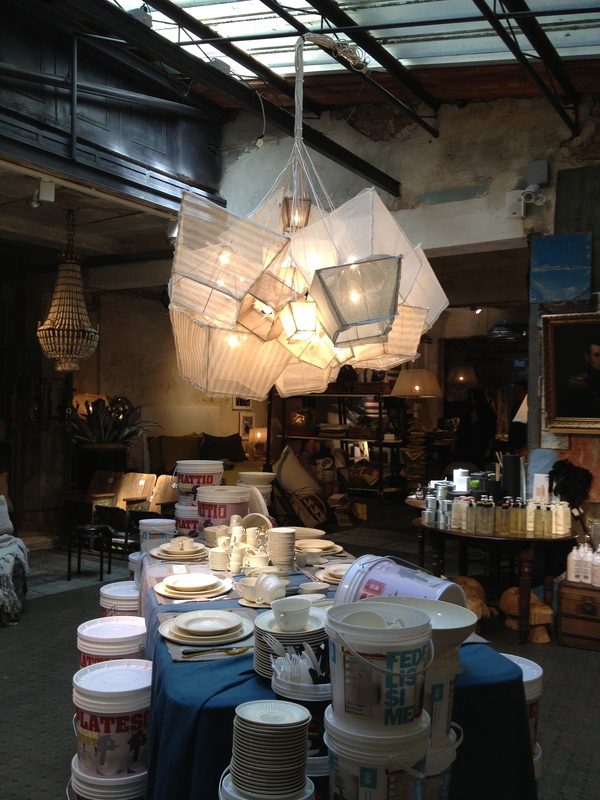 They carry jaw-dropping antiques and stunning modern pieces that have been refurbished into furniture. There are always new pieces coming in. You never know what you might discover during your visit. 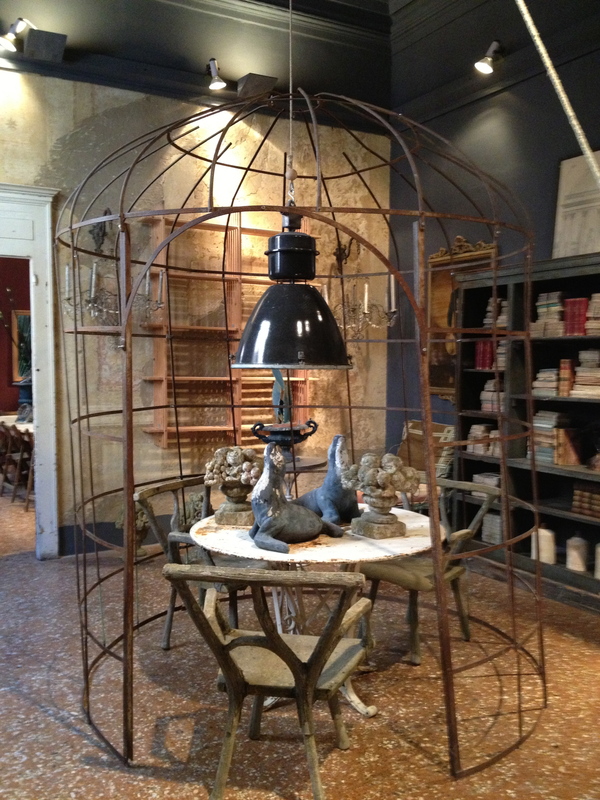 Interior designer Fabrizio Cocchi’s showroom has an elegant, glamorous vibe. It’s bold and full of color. The photo below is of the neutral section. When I first walked in, there was a lot of orange and red. Cocchi also had quite the collection of design books. I would have gladly sat on one of his custom sofas and read for the afternoon. Okay, that would’ve been weird and rude as it’s a store not a library. Beautiful! All on my list for my next trip to Bologna. Thanks! It really is a special city. I love the scale of it. You’re welcome! I’m looking forward to my next trip.